Do you ever find your garden is lacking in late summer colour? Sometimes June and July can be the best months in the garden and by August and September, there isn’t much happening in the borders to bring colour and movement. Early flowering perennials have gone over and most flowering shrubs do their thing in spring and early summer, leaving them green and unexciting for the rest of the year. Now is the time to think about adding some plants that peak in late summer to bridge the gap between the early summer colour and the turning of the leaves in autumn. As the light changes at this time of year to a softer, golden glow, the rich colours of late perennials light up the garden on still, sunny days. First up is the Dahlia – oh how do I love thee? 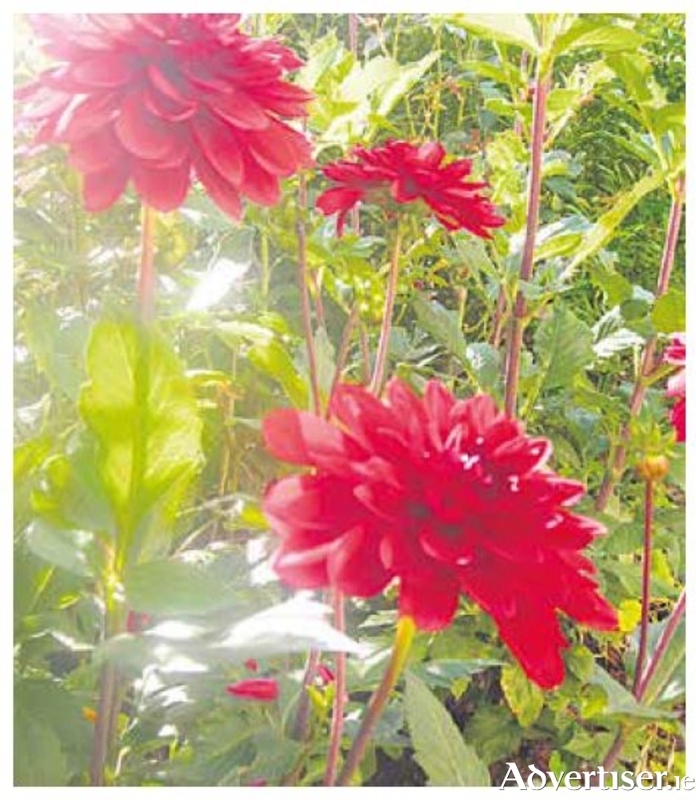 Let me count the ways….Nothing, but nothing beats dahlias for late summer colour. From palest pinks and whites to deep shades of plum and raspberry, there are dahlias to work with every colour scheme, and if you like a touch of fire, bright yellows, zingy oranges and scarlet reds will fit the bill. Flower shapes are varied with spiky cactus types, round pom-poms and single flowers in different sizes. Some have attractive foliage – “Bishop of Llandaff” and “David Howard” spring to mind – both have lovely bronze leaves and stems to complement the Bishop’s bright scarlet single blooms and “David Howard”s burnt orange globes. Although not technically frost hardy, most are fine in our mild winters, with the main danger being from slugs in early spring when new shoots are appearing, so do watch out and apply organic slug pellets in plenty of time. Also adding sunshine to the border is Rudbeckia “Goldsturm”, with daisy shaped open blooms in golden yellow with deep brown centres. Plant in generous drifts behind earlier flowering plants for a cheerful blaze of bright colour. In a gentler, pastel colour scheme, you could find a place for Aster frikartii “Monch”, the most reliable of the Michaelmas daisies, which tends to start flowering towards the end of September with lilac, mauve flowers. Again plant in generous drifts and combine with ornamental grasses in autumnal colours for lovely contrast of shape and form. If you don’t have room for drifts of perennials but still want to see something in bloom then maybe a little shrub would fit the bill – Ceratostigmawillmottianum is a compact, deciduous shrub with good autumn leaf colour, and one of the fewshubs that actually flower coming into autumn. The flowers are a lovely shade of sky blue – a good one for brightening up an otherwise dull group of evergreens. At this time of year we often have a few weeks of high pressure giving us fine settled weather – anyone with school going children knows the weather improves the minute school starts again! So make the most of your garden during these golden late summer days and keep the show going as long as you can!